A very fine post by Susan Schulten at Mapping the Nation inspired me to cite it and comment briefly. 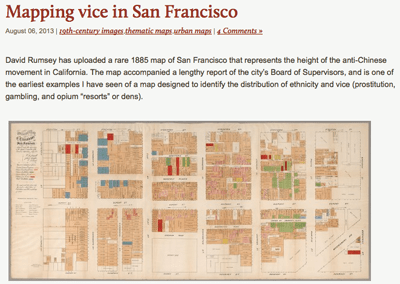 Mapping vice in San Francisco pulls a selection of maps from the fabulous David Rumsey collection that illustrate the rise of political correctness – well, at least in some sense. The first set of maps make very pointed social comments in demonstration that dens of iniquity reside in the Chinatown section of San Francisco. The data presented also attempt to look not only at the purveyors of vice, but the consumers as well – connecting both back to their ethnic origins. The power and authority of the carefully constructed and professionally presented work highlights the use of the cartographic artefact as a tool of political persuasion. As noted the maps presented are artfully constructed (resembling the Sanborn Fire Insurance maps) and they belie what we would today consider the rather nefarious messages. Subsequent exploration looks to more benign and increasingly sympathetic mappings attempting to expose and pinpoint as opposed to ghettoise the subjects. The general chronological demonstration does tend to move in a more hopeful and enlightened progression.